It's time to cut tax for "On Sales"
It's time for me to get a little political about beer. They always say that there are several things you should not talk about when booze is in the mix; religion and politics being two, but it's time to break that rule and face up to the damaging tax regime facing our publicans and restauranteers. In the UK pubs and bars have an annual turnover of £21 billion, that's quite a lot. It would be fair to say that they contribute a great deal to the economy. However, they are still closing at a record rate according to consumer groups such as CAMRA. The current and previous UK governments seem to have done very little to protect the precious British hospitality industry that we all know, love and use. Of course you could mention the Beer Duty Escalator scrapped by Mr Osbourne this year but I would argue that is too little, too late. Picture the scene: large, corporate, clinical boxes- able to retail food at below market value in order to obtain a steady footfall of punters to sell more things to. On the other hand we have small and medium sized businesses who are seeing their peers closing doors all around and who have to try every day to raise standards and come up with new ideas to keep their customers coming back time and time again- no stack 'em high deals here! Which business do you think benefits from 0% VAT on the majority of products? The large, corporate, clinical boxes.... 'em I mean supermarkets. 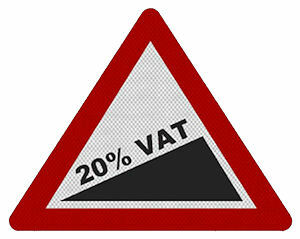 Its time to reduce VAT for pubs and restaurants. Customers buying food in pubs are forced to pay 20% VAT compared with 0% VAT for supermarkets, giving supermarkets a further advantage over and above the many they already have. I understand that people can't and do not want to eat out every night but when an estimated 600,000 jobs could be created with a VAT drop to 5% it is important that we make our politicians listen (ALMR, 2013). Last year, the pub and bar industry created 1 in every 8 new jobs created, we can't turn our noses up to that. France have tried it, and it meant a creation of 225,000 jobs in the first year alone. Mr Osbourne should sit up and take note. It is a campaign that the Scottish Government are already looking in to but we need action for the sake of our pubs and restaurants. The ALMR, Morning Advertiser and Jacques Borel Vat Club campaign are spearheading this campaign. Brains, Shepherd Neame, Fullers, Cains and JD Wetherspoon are just some of the names supporting this important campaign. Just think what a VAT drop could do for the hospitality industry, for the people who rely on it for their livelihood and for the community spirit that pubs can bring to our villages, towns and cities. If, you want to face the HMRC investigations in a stress free manner, then you should not ignore the need to consult a reliable tax advisor in your region. It will certainly be the right way of preventing tax related penalties.